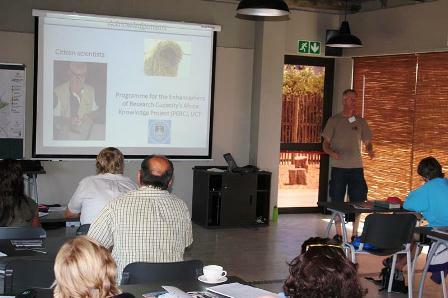 The Animal Demography Unit held a successful one-day conference on weavers on 26 January 2013, sponsored by Project for the Enhancement of Research Capacity (PERC) (Programme for the Enhancement of Research Capacity), University of Cape Town. It was held at the Education Centre at Intaka Island, one of the top birding sites in Cape Town. See also the pre-conference details here. 30 participants attended, including two who travelled from far: Rene van Dijk from his Sociable Weaver study site near Kimberley, and Alex Zaloumis from Hoedspruit. Photo (left) by Les Underhill. On 27 January a ringing session was held at Intaka for those participants that wanted to attend. It was very windy but a number birds, including weavers, were ringed. Most of the weavers in Cape Town finished breeding earlier this year than is normal, but one active Southern Masked Weaver nest was found, and the single chick was ringed - here held by Camdyn (photo left), before replacing the chick in the nest (more photos at phown 5086). Birds ringed include: Barn Swallow, Greater Striped Swallow, Brown-throated Martin, Cape Robin-Chat (recapture), Lesser Swamp Warbler, African Reed Warbler, Cape White-eye, Cape Weaver, Southern Masked Weaver, and Common Waxbill. Thanks to PERC for funding, to Intaka for the super venue, to Diva Cuisine for wonderful catering, and to all speakers and participants!